And to get you all totally motivated to join in the challenge, Kenny K has created some new and fabulous digis which the design team get to play with! For my card I have used the stunning Savannah Belle. The papers are from Prima's Botanica. It's an older pad but new to me! It was so perfect for this image with its gears and travelling type images.The tag came from the pad, too! Another short and sweet post as I am still out of town and enjoying vacationing with my husband and kiddos! Have a wonderful week and hope to see some fabulous projects from you all when I find some spare time to pop into the Kenny K blog! Hi Danielle, had to pop over and let you know how much I admired your card this week, you have done a stunning job colouring Savannah, looking at the way you used the folds in the dress I wish I had done the same, yours is amazing. Love the blog and have joined, I will deffo be popping over to see you again, I love people who inspire me. 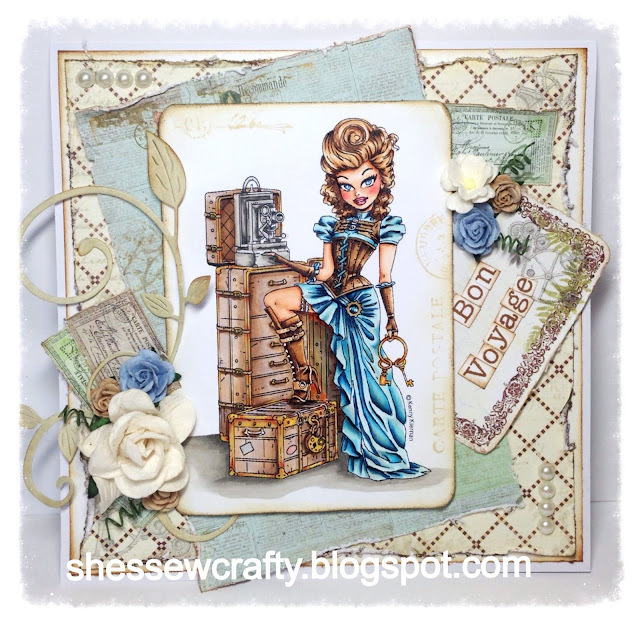 Beautifully vintage Steampunk card, Danielle! Your coloring is fabulous! I love how you distressed the edges and your embellishments are gorgeous! What a wonderful card. Just love the feel to it. Great use of the image. Thanks for linking up with us over at my sheri crafts this week. Good Luck. I love your card and the coloring is just fabulous! I've seen this image debut this week and I think I will have to break down and add to my collection. Thanks for joining us over at 613 Avenue Create this week. Thank you for sharing at That Craft Place this week. What a beautiful, feminized version of Steampunk! Thanks for joining us at My Sheri Crafts.